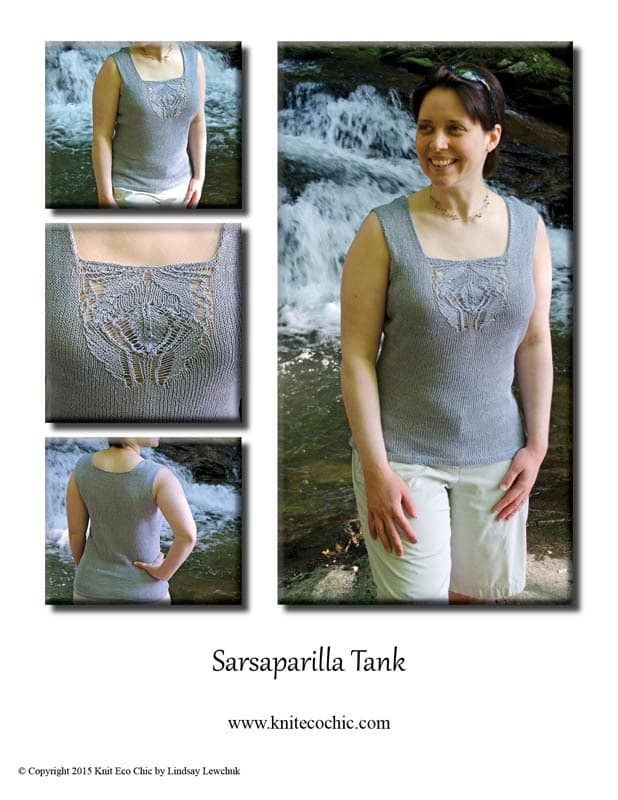 A summer staple, Sarsaparilla Tank integrates a lace detail inspired by the sassafras flower into a seamless knit fitted design. Use the custom shaping calculator, an interactive PDF debuting with this design, to get your perfect fit! Look your best and stay cool in the light weight organic linen regardless of where your hot summer daily activities take you; whether it’d be hiking waterfalls or chasing after kiddies. Summer knitting is calling! The Custom Shaping Calculator debuts with this design. The calculator calculates your perfect hips, waist, and bust fit within the given limits of the tank. The tech edited & test knit intermediate level pattern includes written directions with the lace fully written and fully charted for 12 sizes. The pattern also includes a schematic, custom shaping calculator, and how to video. For Bust Sizes: 32”/ 81cm (34”/ 86cm, 36”/ 91.5cm, 38”/ 96.5cm, 40”/ 101.5cm, 42”/ 106.5cm, 44”/ 112cm, 46”/ 117cm, 48”/ 122cm, 50”/ 127cm, 52”/ 132cm, 54”/ 137cm). 24 sts and 36 rows over 4”/ 10cm using US 3/ 3.25mm needles in Stockinette Stitch. This pattern is worked seamlessly from the bottom up worked in Stockinette stitch with a lace detail. At the underarms, the garment is split in two parts, back and front, with the lace detail continuing up the front. If substituting fiber, reduce or skip the shoulder short rows and work even until desired length. They are included to accommodate the unique drape characteristics of 100% linen. See “Inside the Self-Hemming Cast On” on the Knit Eco Chic blog for a video demonstration of the technique. The “Custom Shaping Calculator” (also available on the Knit Eco Chic website) ensures you get your perfect fit. The calculator provides custom shaping directions for transitioning between the given sizes. Follow Knit Eco Chic’s board Moments Along the Trail… on Pinterest.